Syrian troops have retaken a key rebel-held town south of Damascus, state media and activists say. State TV said the army had full control of Sbeineh and that "terrorists" had been driven out. UK-based activist group the Syrian Observatory for Human Rights said Sbeineh was one of the most important rebel positions near Damascus. Meanwhile, inspectors say they have verified one of Syria's two remaining chemical weapons production sites. Inspectors had already verified 21 out of 23 sites declared by Syria but two sites were too dangerous to reach. They said the latest site - near Aleppo - was verified using footage from sealed cameras and that it was dismantled and abandoned. News of the army's takeover of Sbeineh was broadcast by state TV on Thursday. "Our brave army has taken control of... the Sbeineh [area]... and [the nearby village] of Ghazalah in Damascus province after crushing the last terrorist positions there," it said. The government refers to rebels as "terrorists". Rami Abdel Rahman, director of the Syrian Observatory for Human Rights, said the army had been backed by Lebanese Hezbollah fighters and other pro-government militia. "Rebels in southern Damascus have now had practically all their supply routes cut off," he said. Earlier, a statement released by the Organisation for the Prohibition of Chemical Weapons (OPCW) said photographs and footage provided by Syria showed the building empty near Aleppo with "extensive battle damage". The exact location and the time that the images were taken were fully authenticated, the statement said. Syria has agreed to destroy its stockpile of nerve agents and chemical munitions by mid-2014. It has declared about 1,290 tonnes of chemical weapons and nerve agents as well as 1,230 unfilled chemical munitions - meaning shells, rockets or mortars. A Syrian delegation is at the OPCW headquarters in The Hague this week to work out where and how to destroy the stockpile. The deadline to finalise the plan is 15 November. 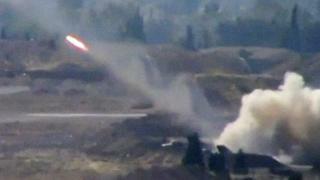 Damascus has proposed destroying its stockpile outside the country because of the continuing civil war. Hundreds of people died in a chemical weapons attack on the edge of the capital in August. The Syrian government denied it was behind the attack. However, following a threat of force by the US it agreed to a joint US-Russian deal to destroy its stockpile. More than 100,000 people have been killed and about two million people have fled abroad since the uprising against Syria's President Bashar al-Assad began more than two years ago. The UN-Arab League envoy on Syria, Lakhdar Brahimi, had hoped to hold the conference in Geneva this month. But earlier this week he said he was not able to announce a date, despite a day of meetings first with senior diplomats from the US and Russia, then with the other permanent members of the UN Security Council - the UK, France and China - as well as Syria's neighbours Lebanon, Iraq, Jordan and Turkey. Mr Brahimi said he was still "striving" for a summit by the end of the year.